We have grown up idolizing cricket in the purest of its forms - not corrupted by the unnecessary hooliganism of the late 20th and 21st centuries - rather a magical symphony. The symphony that it draws from the spirit with which it has been played over the years is often hypnotizing. In the early 90s, playing in Sydney's streets, Steven Smith must have grown up worshipping that spirit of cricket, personifying it and practising it at the peak of his conscience. Nothing else could have turned him into one of the greatest Test batsmen in the history of cricket. But the hysteria that followed the March 24 Sandpaper Gate Scandal had the world thinking otherwise. The greatest contemporary Test batsman was in tears, after being characterized as a cheat, deported back to his country like a seasoned drug lord in custody. What was his crime? He accepted having taken the decision to make his youngest teammate change the condition of the cricket ball artificially to win a game for his country. Later that evening, he went on to accept his mistake in front of the world. A leader had failed. But a human being had risen. Spirit of the game, as they call it, had changed the narratives around the world overnight. It was refreshing to witness a storm rising inside cricket aficionados against the corrupt practices around the cricketing world. It would have been much more refreshing had the same storm demolished the corrupt mindsets of the flag-bearers of the ICC who decided not to let associate countries live their dream of playing against the best of the world in the World Cup 2019 not so long back. But it was a welcome change. It would have been much more welcome had they listened to Sikander Raza's speech a couple of days ago. Justice was served soon after. A statement was made that world cricket would not accept even an ounce of unfair practice. Around the same time, across the Indian Ocean, in the capital of India - home of the richest cricket board in the world - a certain N Srinivasan showed his strength against the CoA with the support of 22 members of the BCCI. But the greatest contemporary Test batsman was made an example of. But at the cost of what? Cricket has never been the Gentleman’s Game that it promises to be. It has been played by a few gentlemen at times. But mythology has survived and the world has had a history with religion. Cricket is one. We have been deprived of a great story being unfolded during our time. A player was single-handedly crushing the greatest of contemporary bowlers around the world. He made a mistake for the sake of his country. He was desperate to win a Test. He deserved a punishment. But for the sake of the reputation of the country he was fighting for, he was awarded a punishment that can never be justified. The arguments will never die. But the tears in his eyes are a testament to his guilt and acceptance. I have had tears for martyrs of my country. I had tears for him today. A year down the line, when he picks up the willow, wears his pads, puts on his gloves and steps on the lush green outfield once again, I will rise behind him with the roar of a billion fans. Because the greatest cricketing hero of our time didn’t give in to his ill-intentioned efforts like some of the greatest cricketers of the previous generations. He will be serving a penalty that he never deserved. Next time a rookie makes a mistake, walk up to him, let him know that he made one and hug him back. Do not let him become another Steven Smith. 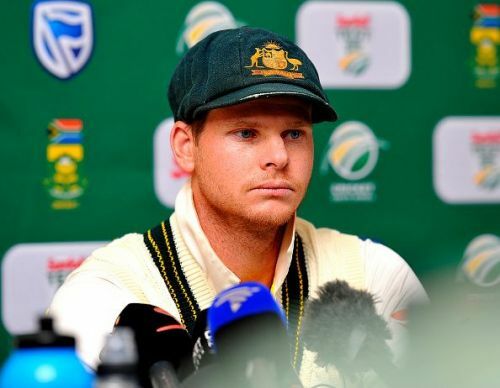 World cricket doesn’t deserve a Steven Smith. But it needs one.